Many people have been depending on faulty information for earthquake survival. The "Triangle of Life" method is the worst problem. This advice is agreed to be wrong by a long list of reputable rescue organizations. The advice they all agree on to survive an earthquake is, "drop, cover, and hold on". Getting in doorways is also bad because they are based on building methods that are rarely used now and on an unrealistic test. I was given an example of why doorways are bad now. Alaska had a big earthquake recently. (So what else is new? We get them all the time. We are used to them.) The only single casualty we had was a woman who got her arm broken and was very bruised and battered elsewhere. She got in a doorway and bashed repeatedly by the door swinging back and forth and hitting her. Even worse news about doorways is that because of the way buildings are built now, they are no structurally stronger than the rest of the building. Not only will you not be protected by a doorway, but you are risking being savaged by a swinging door as well. Stay out of doorways in earthquakes. Getting under something during an earthquake is only hazardous if the building collapses straight down like a pancake. Earthquakes don't cause that sort of collapse, so you Do want to get under something during an earthquake. The "experiment" that provided the "Triangle of Life" theory was based on a building demolition in Turkey. The demolition method caused a pancake collapse. If you want to survive a building demolition, don't be in it when it is demolished. 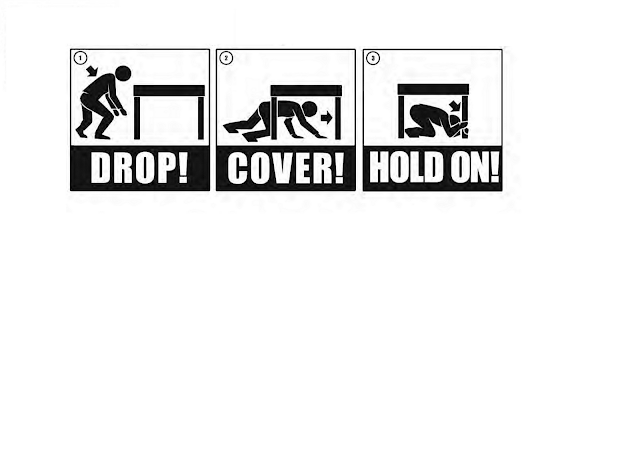 For earthquakes, get under something and follow the correct advice: "drop, cover, and hold on". The people who run Shakeout try to organize earthquake preparedness practice days once a year in earthquake areas. They have information for organizing one in your area if you are interested. Below is a site that explains the controversy about the "Triangle of Life" idea for earthquake preparedness. My boss at my local disaster preparedness center told the people at her monthly seminar about this problem. She also told us about the local woman who got her arm broken by trying to shelter in a doorway during an earthquake. I intend to stay out of doorways from now on during earthquakes. You might like to do the same. I am also going back to, "drop, cover, and hold on", during earthquakes. That might be good for you to do as well. Labels: Disaster preparedness, earthquakes, emergency preparedness.